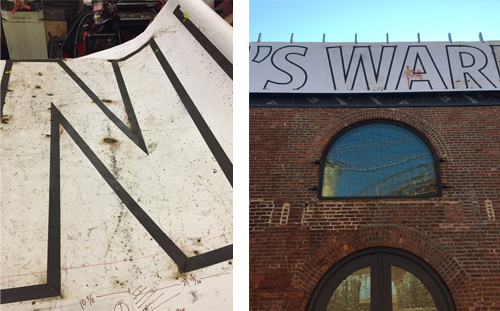 St. Ann’s Warehouse Signage Program - Flyleaf Creative Inc.
After a $31.6 million renovation St. Ann’s Warehouse has found its home on the Brooklyn Bridge Park waterfront in the historical landmark building of the Tobacco Warehouse for generations to come. Flyleaf Creative developed a comprehensive design plan for the exterior and interior signage program for the renovation of the St. Ann’s Warehouse in close conjunction with St. Ann’s Executive Leadership, Marvel Architects, DBI Projects, Charcoalblue, Yorke Construction, Brooklyn Bridge Park, Signs & Decal, and artist Tom Fruin. 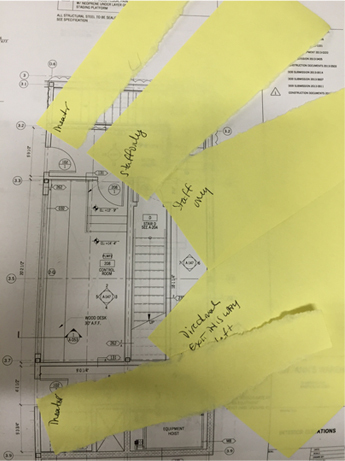 The program includes primary exterior signs including bulkhead installation, custom lightboxes, and theater marquee; secondary signage for major donors and interior wayfinding; and tertiary signage for ADA compliance, chair seating, and theater row identification. Flyleaf Creative worked closely with Artistic Director Susan Feldman to develop an updated brand identity that could be flexible enough on a large scale to feel a kinship with its surrounding iconic industrial environment while working in traditional digital and print media. The typeface Whitney Condensed by Hoefler & Co. have been used throughout the signage program. The 3-dimensional bulkhead sign was created and fabricated by artist Tom Fruin who took our intention and created a beautiful iconic sculpture. Each letterform was hand-welded by Fruin and his associates and measures approximately 6′ tall x 2′ deep. Both Fruin and Flyleaf worked very closely with Marvel Architects in designing the proper installation for a sign that grows to a full width of 71′. 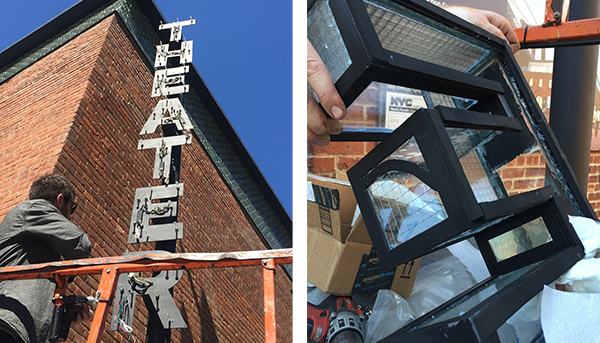 With Marvel and the expertise of Charcoalblue, we collaborated on concepts for fastening the sign and affixing a lighting system that would feel integral to the piece. The THEATER marquee was designed to stand as a shining beacon on the corner of Water and Old Dock Streets signaling to passersby their arrival at a cultural, historical, and architectural landmark. Designed with Tom Fruin’s characteristic materials neon, steel, and glass, each hand-crafted 3-dimensional letterform is a piece of unique sculpture. Each facade incorporates found industrial scrap glass much like what would have been used on the site 100 years ago. Given that the Tobacco Warehouse is protected as a landmarked building, the marquee could not be attached directly to the brickwork. 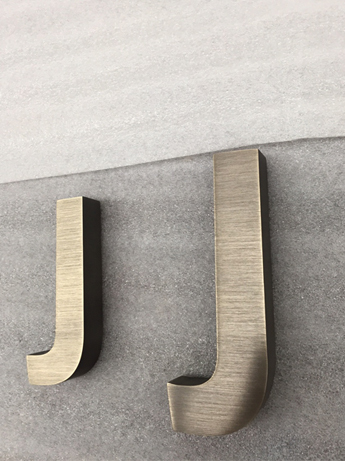 Significant partnership with Marvel Architects, engineers, and electricians resulted in developing a 23′ tall pole system that the letterforms could be safely attached to and electrically wired while still feeling like it had been there all along. Remaining true to the industrial materials used throughout the building, blackened steel and layered plywood make for subtle dimension when finding one’s way. 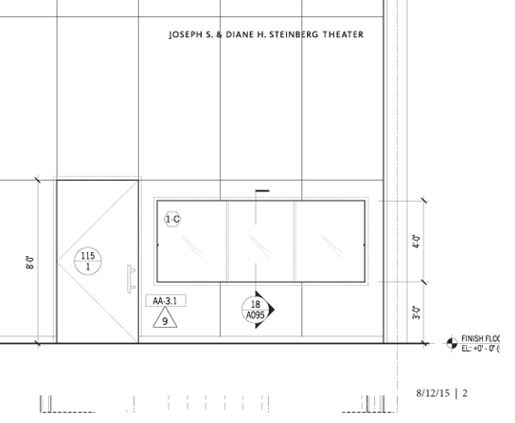 St. Ann’s new theater named in honor of Joseph S. and Diane H. Steinberg sits elegantly and understated in 3/4″ bronze above the new box office. 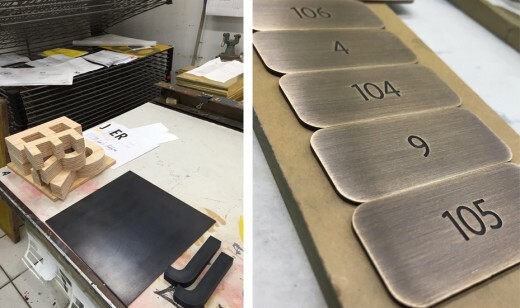 All of the donor signage was designed to feel natural in its environment, responding to the clean sweep of material surfaces of blackened steel walls, plywood, and poured concrete.